Actually, i couldn't care less about what's known about that one downed Eaarth-killing-machine. IF i could care any less about anything it'd be about what's not known about that oh-so-important matter. The "age of information" -- with myriads of disjointed data snippets, delivered at lightspeed from all round the globe, to be forgotten tomorrow, and with an action/information-ratio (sensu Neil Postman; see **MUST**READ** "Amusing Ourselves to Death" 1985) approaching zero. Speculation of things unknown have always been of interest to people, and with all 24/7 information media it is just more so in our faces than ever before. It is intriquing when unexplainable things happen that appear to be beyond our current knowledge and understanding, the persistance of investigators to explore all possibilties have lead to some amazing developments in our society (albeit not always postive). It might be that the link here is beyond Planet Earth or it maybe a man-made tragedy. Rather than make mindless bitter comments about aircraft and speculation about the cause of the crash we should remember those who grieve and remember them in our thoughts and prayers.The dead are now in the care of the Lord God.The living are experiencing unbearable grief ,remember them. I do not weep for the dead. I weep for the living. All those passengers are now in a happy place, but my heart goes out to all the relatives and friends. The one other odd event being the hand over regarding Air traffic control at the same time as the plane vanishing from radar ! Agreed Boods. This site is getting nastier and nastier. I find that really sad. But that's our world now. It's a mean, scary place. I pity the future generations. David C., WTF??!! I pity you. It's not right that death of the passengers and crew are presumed - rememberance and concern for the missing people is perhaps more constructive at this moment, as it is still quite a mystery, as there is no evidence of death. Though it is very likely that is the result it has not been proven. It is still a mystery. There is nothing concrete. 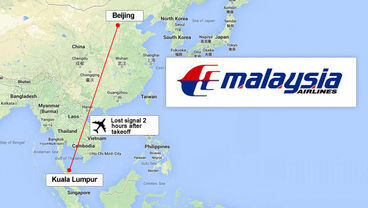 I just pray that these passengers are still safe, until they have final evidence. Thanks Carrie....I await further information on this missing plane.